When your oven is smoking, it is very easy to panic–after all, a fire in the kitchen is a situation most of us want to avoid at all costs! Not only that, but smoke billowing out of the oven is pungent and difficult to dispel even with open windows and other ventilation. There are several reasons why your oven may be smoking. This troubleshooting guide can help you locate, isolate, and resolve the issue. WARNING: To prevent the risk of burns and electrocution, disconnect your oven from the power and allow it to cool before investigating. If you suspect there’s a risk of fire in addition to the smoke, please call your local emergency response agencies. 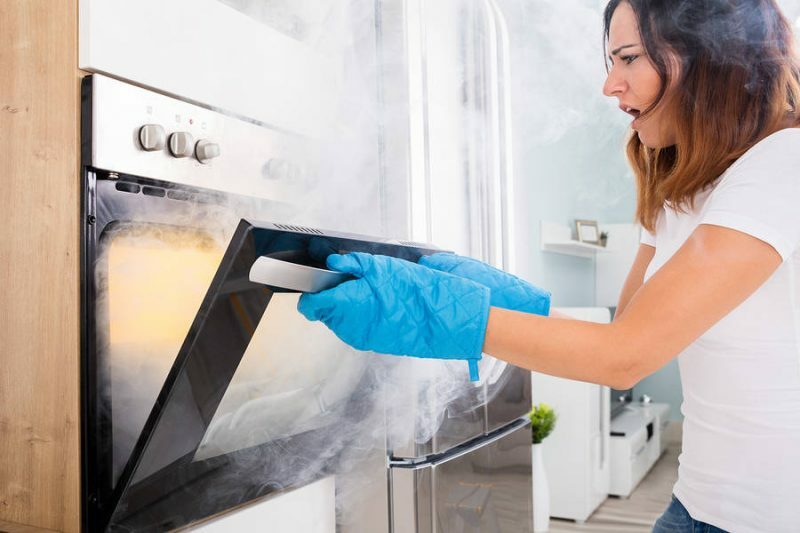 If you’re unable to find the cause of why your oven is smoking, give us a call at It Is Fixed Appliance Repair for a quick, thorough evaluation. Over time, food pieces and particles can accumulate inside the oven cavity. When you heat the oven to cook a new meal, the food debris may smolder or even burn, creating an unpleasant smoke that wafts from your oven interior. Regularly cleaning your oven will help to reduce the build-up of food particles. Ovens with a Self-Cleaning feature will reduce food pieces to ash. Afterward, you can wipe them out of your oven cavity with a damp cloth. Please read our Oven Maintenance Guide before using the Self-Cleaning feature on your oven for important safety information. Like food particles, grease is one of the most common causes of an oven smoking, especially after many years of use. You can use a degreasing cleaning agent to help cut through grease splatter, which will help to eliminate smoking and odor when you’re cooking! WARNING: Do not use commercial oven cleaners on self-cleaning ovens unless it is formulated for self-cleaning ovens. Regular oven cleaners may damage the finish of a self-cleaning oven. To prevent grease splatter, use dish covers and a foil-lined baking sheet on the bottom rack of the oven to catch drips. Do not line the inside of your oven with foil as this may cause the elements to overheat. If your oven is smoking soon after cleaning it with a cleaning agent, leftover residue could be the culprit. Cleaning agents may affect the taste of your food when heated, so it is important to remove it all. First, make sure your oven is unplugged and cold to the touch. Next, wipe the inside of the oven and heating elements with a damp cloth. Important: Do not spray water directly into the oven. If cleaning agent remains, consult the label on your cleaning product for further instructions on how to remove residue. The first time you use a brand new oven, or even a few times after that initial use, it is possible for your unit to smoke slightly or even produce an odor. Don’t worry – it’s entirely normal! This is often caused by the materials used in the creation of the oven itself, especially the special oils that coat the inside of the oven cavity. Fortunately, the smoking typically dissipates after a few uses on its own. Cooking food too close to the broiler can create smoke. This is especially true for food that is high in fat such as a steak and bacon. Try lowering your oven rack away from the broiling unit since it is scorching hot when in use. Some recipes and cooking methods might also allow you to cover the meal that you’re broiling, which can further reduce the risk of smoking during the cooking session. If your oven is still smoking after following these troubleshooting steps, It Is Fixed Appliance Repair can help! We’re available for appointments in the Atlanta and Metro Atlanta area seven days a week. Contact It Is Fixed today for an appointment.